'Yooper' Blooper: Dictionary Misspells New Entry : The Two-Way Merriam-Webster has added 150 words to its Collegiate Dictionary, but it forgot to include the "p" in its pronunciation guide to "Yooper" — a term describing people from Michigan's Upper Peninsula. If you need to know how to pronounce the term "yooper," this version of Merriam-Webster's Collegiate Dictionary might not be the best guide. Yoopers were excited that they made the dictionary. It's too bad people won't learn the right way to pronounce their nickname. 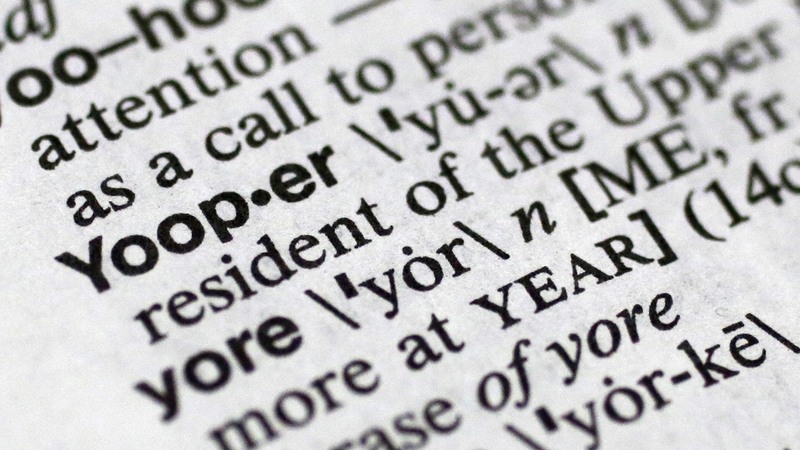 As we noted Monday, the Merriam-Webster's Collegiate Dictionary has added more than 150 new words and definitions, including Yooper, which it defines as "a native or resident of the Upper Peninsula of Michigan — used as a nickname." See, "Yooper" is derived from U.P. Only Merriam-Webster left off the "p" in its suggested pronunciation. "Yes, unfortunately a 'p' is missing from the pronunciation," Merriam-Webster spokeswoman Meghan Lunghi, told The Associated Press. "The rest of the entry is fine." I guess close really does count only in horseshoes and hand grenades. In other new-word news, Merriam-Webster also enshrined "selfie," a term and concept that was mocked at the Webby Awards on Monday with a compilation video of misguided self-portraiture titled "Selfie in Memorium."